A unique combination of sleek, sharp silhouette and cushioned comfort, the Charlotte Sofa makes a statement with a slanting shape that seems to convey a sense of creative movement. Expertly upholstered complete with meticulous tufting detail, the Charlotte Sofa is available in a range of shades from understated to out of the ordinary. Constructed of high-quality materials by skilled craftsman. Classic tufting detail adds textural appeal. Cushions are topped with a layer of memory foam to provide maximum comfort. So GREAT in lime green especially in person! I honestly don't think the photos do it justice, HIGHLY SUGGEST! The deep tufting and leg design is what got me on this sofa, absolutely stunning design, thank you! Very impressive leg design! Subtle details when it comes to furniture are my thing - this sofa is perfect! Design was the selling point for me here which i still adore but i think its important to note that color of upholstery can look different in person - definitely call customer service and ask for swatch samples! Very excited about my recent inmod purchase. My sister and I bought this for our apartment and it looks phenomenal in our living room. ProsSuper cool base, nice fabric. Absolutely obsessed with the legs on this sofa. It is modern and perfect for my living room. It is comfy and the price can't be beat. Delivery went smoothly and overall I couldn't be happier! Was looking for something with a darker color but was over the browns and blacks. Found this dark blue color sofa and am very happy with my buy. Is there a fabric you would recommend that is both child (toddler) and dog friendly? Thank you. 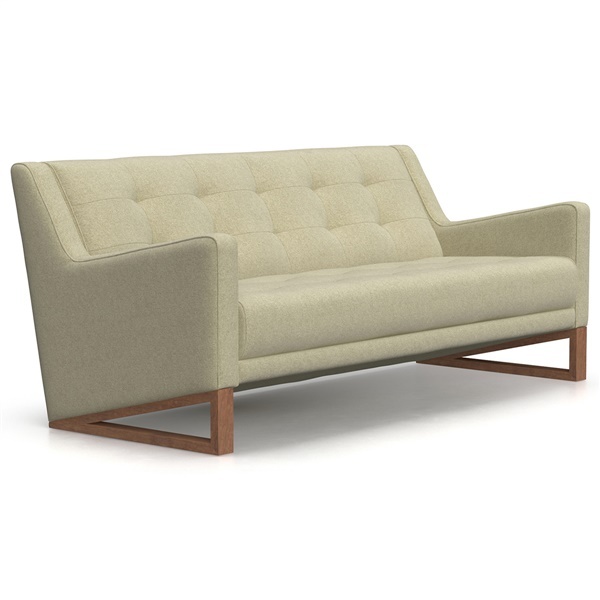 The Charlotte Sofa does not have any flame retardants in the upholstery or in the foam. The legs are made of solid wood. The cushions are made of medium density foam, and the upholstery is made of 100% polyester.